Let's Do It for ME! : IiME/UCL Rituximab Fund £50k! Work can begin! 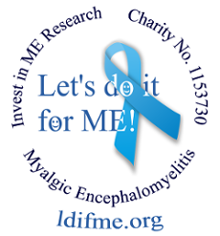 On 6th June Invest in ME announced that we were in discussions to set up a UK trial of rituximab for ME patients and since that announcement things have been progressing well. The charity had been working on trying to get such a trial started since the IIMEC7 conference. In updates published through June/July, we have stated that all that is required for the trial to proceed is the funding. As such, IiME began fundraising for this trial and invited everyone to support us in this project. We have the facilities available. We have the researchers available. We have the best expertise possible available. As we have agreed with our advisor, Professor Jonathan Edwards, the proposed clinical trial will undergo a rigorous peer review process. We have reached this position thanks to the vision, efforts and help from Professor Edwards, Dr Cambridge, UCL and our supporters. We have emphasised from when we announced the trial that the only element required is funding. IiME will continue organising and raising funds for this trial. The IiME BRF Rituximab fund is specifically ring-fenced in a separate account for the UK rituximab trial. The first part of the trial will be a preliminary study which will confirm the earlier work of Dr Amolak Bansal  on B-cells but using a different cohort of ME patients. Professor Edwards believes this is a useful study in its own right and a pre-requisite for the clinical trial. Meanwhile work is continuing on the design of a protocol which will be finalised after the trip to Bergen that IiME and Professor Edwards have arranged. Good progress is being made and IiME are committed to expedite this trial as best we can. To achieve this IiME has recently been in discussions with a charitable foundation with a view to help in funding this work. This now means that the first part of this project can be initiated by the UCL team without delay. We thank all those who are supporting this trial and we will continue to provide information on the status of the trial as we progress. We now resolve to increase our efforts to raise the remaining funds for the trial and ask for your continued support in this project in the knowledge that it will benefit all people with ME and their families. The fundraising for this trial is being organised and coordinated by IiME so please contact IiME directly if you or your organisation would like to assist or contribute. If anyone would like to ask any questions about the UK rituximab trial then please use the Contact form on the rituximab web site (click here). In summary we feel that the best research team possible to undertake this trial is now able to begin the work) - taking a huge leap forward in ME research in the UK.